At MCN we emphasize evidence-based medicine, and our doctors support each of their claim decisions with referenced sources and years of training and practice. But in the world of science and medicine, interpreting findings isn’t without disagreement and it sometimes takes years to find medical solutions to disease and injury. This article from The New York Times demonstrates this conflict as doctors around the world debate whether tissue plasminogen activator (T.P.A.) can prevent brain injury after a stroke or if it does more damage than good. Dr. Christopher Lewandowski, the principal contributor to TPA research and findings, proved that this clot-buster drug could open up the blocked vessel in the brain during a stroke and prevent/minimize permanent disability in the future. The first clinical trial to test this drug took place 22 years ago, and Dr. Lewandowski is still trying to explain the data to doubtful doctors around the world who refuse to use it. On the flip side, doubters question the validity of the first experiments saying that they were flawed because TPA was used on the least severe type of stroke. Those receiving the remedy, therefore, were less badly effected from the start, and professionals are unsure if the recovery can be credited to TPA or natural causes. 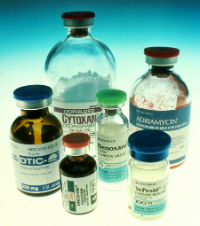 Eleven other experiments have shown no benefit to TPA, but those studies were conducted on severe stroke patients and those outside the recommended window of time for TPA to be administered. 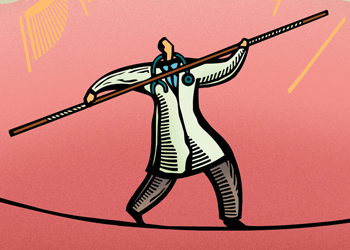 As the medical field progresses, cures and conflicting opinions will continue to exist. That’s why we believe in the power of a second look. 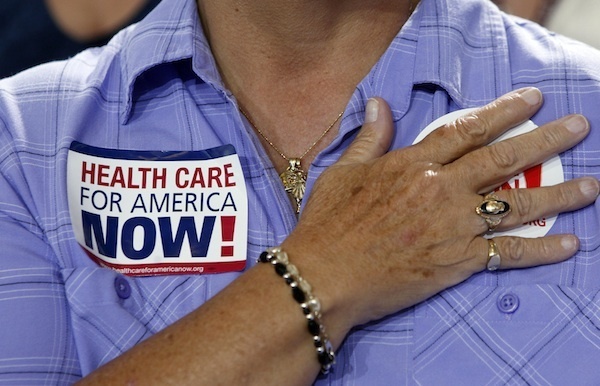 Making ObamaCare Work: Will States Meet their Nov. 16th Deadline? After Tuesday’s election, it seems years of uncertainty over President Obama’s health care law have finally been put to rest — at least for now. While several states have already submitted the framework for their health insurance exchange program, others waited for the election results and are now scrambling to meet the November 16th deadline next week. Many states have asked for more time. Under the Affordable Care Act (ACA), every state is required to submit a blueprint of their own health insurance exchange or participate in a federal-state partnership. If states do not establish their own exchanges by the deadline, the federal government is prepared to step in and assign a federal exchange or a federal-state partnership model. But the early bird gets the worm. States like Illinois, Nevada, Oregon, South Dakota, Tennessee, and Washington who have already taken the initiative to create their own framework have already received over $181 million in grants from the government to help establish their exchanges. President Obama faces many crucial decisions in the coming months about how best to appeal to those who are for and against the ACA if it is to succeed. Will the administration, for example, try to address the concerns of insurers, employers and some consumer groups who worry that the law’s requirements could increase premiums? Or will it insist on the stringent standards favored by liberal policy advocates inside and outside the government? 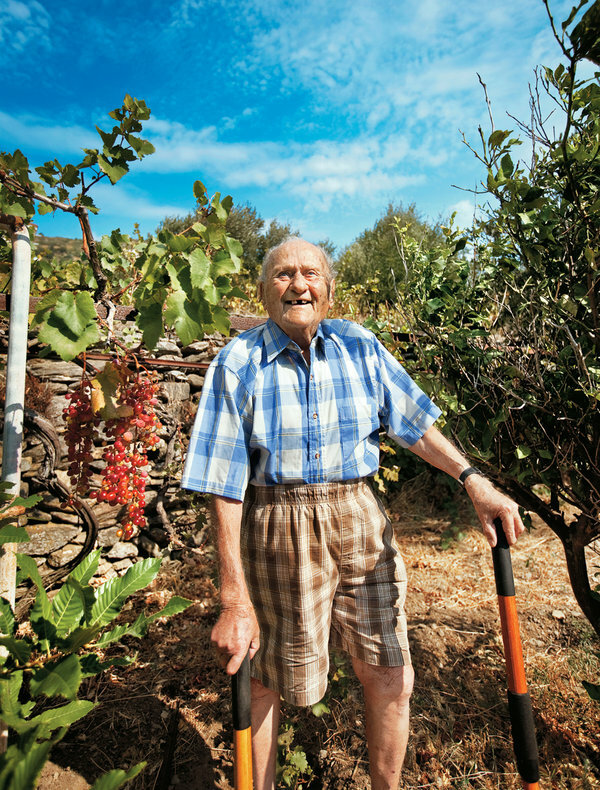 Stamatis Moraitis on his vineyard on Ikaria Island. The New York Times article, “The Island Where People Forget to Die,” is provocative. It describes the island of Ikaria, a place known for unusual longevity. The case is made for multiple environmental determinants causing this. They include diet and exercise, but most importantly it would appear that a unique focus on harmony, relatedness, and relationships within the island community positively impact health. The story of an Ikaria native, Stamatis Moraitis, is particularly intriguing. After moving and building a family in America for several years, he was diagnosed with cancer in 1976 and the doctors estimated he had nine months to live. With little hope to fight the cancer, he moved back to his native island to be buried among his ancestors. Six months came and went. Moraitis didn’t die… The years passed. His health continued to improve. He added a couple of rooms to his parents’ home so his children could visit. He built up the vineyard until it produced 400 gallons of wine a year. The traditional values and lifestyle described in the article are threatened on Ikaria, and are rare elsewhere. We suspect you will pass this on. Consider reading some of the many comments as well. 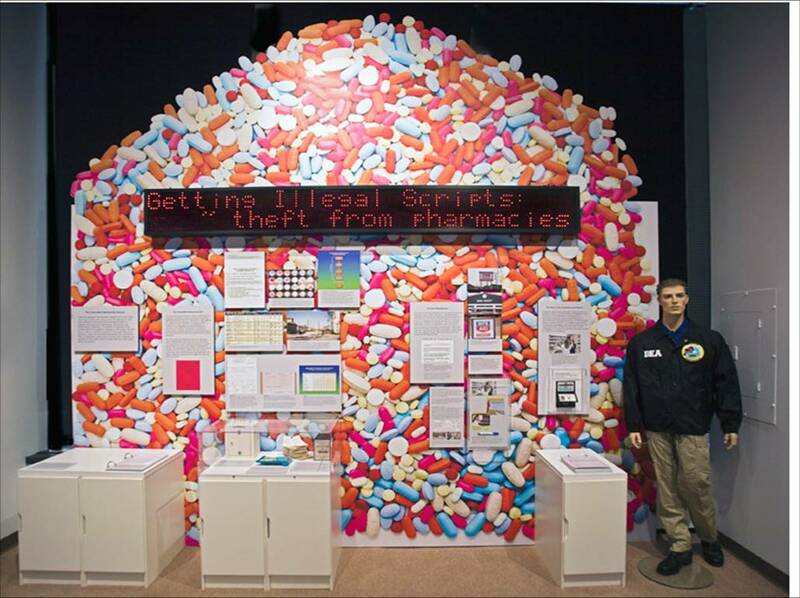 Over the past few months, the DEA has tried a variety of different tactics to battle our painkiller epidemic. From arresting hundreds of doctors, cracking down on pill mills, and investigating pharmacies, it’s most recent attempt has large drug distributors rattled. The New York Times reports that after honing in on Florida and Ohio, the DEA is now putting pressure on other pharmaceutical distributors nationwide. Earlier this year, the agency charged drug distributor Cardinal Health for violating it license to sell controlled drugs. Since then, Cardinal no longer does business with a dozen pharmacies in Arizona, California, Nevada, and Oklahoma and the number is growing. The article notes that the pressure has pushed distributors to create a nationwide shipment reduction to pharmacies and doctors who order a high volume of narcotic pain killers. “We had a strong anti-diversion system in place, but no system is perfect,” Cardinal Chairman and Chief Executive told the Times. Since then, they have strengthened their criteria and have also created a committee that evaluates pharmacies that order large amounts of narcotic drugs. Another major distributor, AmerisourceBergen, recently disclosed that it also faces a federal criminal inquiry into its oversight of painkiller sales. The DEA’s crackdown on pharmacies and big distributors like Cardinal and AmericsourceBergen have shown that the agency is taking a much more aggressive approach to ending our nations painkiller issue. However, doctors and pharmacies are critical of the way distributors have abruptly cut them off from their supply. One California pharmacist argued that his pharmacy specializes in pain patients which would explain his high volume orders. There is also added incentive to sell Oxycontin and other narcotic painkiller because of their addictive properties and because street value on the black market is as much as $80 per 80-milligram dose. However, while the DEA is implementing new tactics against distributors for failing to notify the agency of a “suspicious order” from a pharmacy or other customer, it does not share those reports with officials in the state where the pharmacy is based. After the New York Times had asked for the agency to disclose the number of such reports it received annually, they declined saying, the agency considered such statistics “law enforcement sensitive” information. Memorial Sloan-Kettering Cancer Center says no to Zaltrap, an $11,000-a month cancer drug. In the case of Medicare beneficiaries, they do share in the cost of medications, but generally insured individuals are frightfully blind to the cost of their care. Thus it falls upon payers and physicians to make rational decisions on behalf of patients, and the cost should be part of the equation. The cost may be relative to doing nothing, or as stated in this article, to an alternative treatment. To suggest that price should not be part of the decision process in health care is naïve. A life is priceless, but the cost of maintaining life in a world of finite resources must include a realistic assessment of the impact of the intervention and the price associated with it. To do otherwise diverts these resources from other uses, that might include more impactful treatments for individuals and society. Access to insurance is a matter of life and death for some. In this poignant New York Times column, “A Possibly Fatal Mistake,” Nicolas Kristof tells the sad story of his childhood and college friend, Scott Androes, who made a bad choice and may pay with his life. That choice was not purchasing health insurance when he was marginally employed and realistically able to do so. For Scott, like many Americans, the thought of buying an individual policy in a high risk market seemed too expensive and unnecessary. But after months of warning signs and a trip to the emergency room later, Scott realized how costly taking that risk would be. This year, he was diagnosed with metastatic prostate cancer and a treatment plan that is upwards of $550,000. It would appear that his days are numbered. The key point that Kristof makes is how crucial it is to put our partisan bias aside and consider the millions of U.S. citizens who are currently affected by our broken health care system. Which presidential candidate will actually work to fix and prevent stories like this after the election? 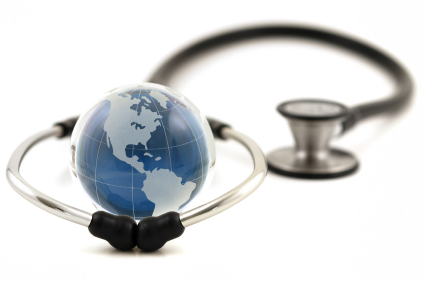 Does recruiting imported physicians create more problems than solutions? The New York Times issued an Op-ed article last week that brings both good and bad news about our current healthcare employment dilemma. While jobs in the health care sector have increased by more than 1.2 million this year, there seems to be an imbalance in our medical education model and the number of foreign physicians we import. The article “America’s Health Worker Mismatch” addresses the fact that despite increased demand for their graduates, medical schools have done little to expand their output and therefore must turn away hundreds of thousands of qualified medical school applicants. What’s more, our medical school tuition costs have increased by 312 percent in the past 20 years and some health specialties have raised the bar for education credentials – meaning more years of school, higher attrition rates, higher debt, higher wage demands and fewer workers from low-income areas. The author of the op-ed, Kate Tulenko, is the senior director of health system innovation at IntraHealth International and author of “Insourced: How Importing Jobs Impacts the Healthcare Crisis Here and Abroad.” She explains that the United States dependence on foreign-trained health-care workers is creating a mismatch in our health care work force. This trend is worrisome as most foreign-trained physicians applying to U.S. residency programs come from countries that are suffering a severe health service shortage. It raises the question: Does recruiting an imported physician workforce create more problems than solutions? The United States- A Third World Health System? This rather long feature article from the New York Times magazine is worth a read on many levels. It is an in the trenches view of the reality of life for too many American’s, and some creative efforts to import a system that had value in Iran to the poor of Mississippi. 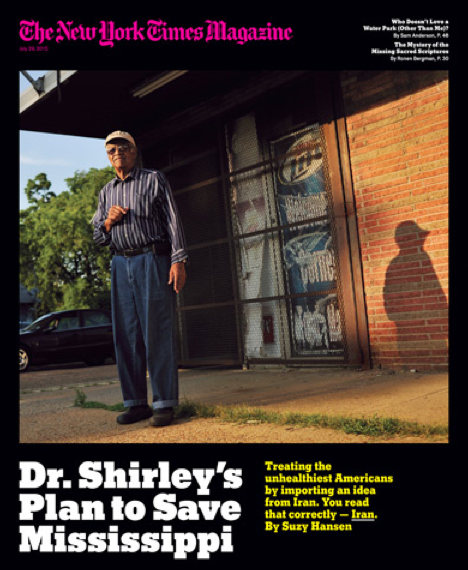 The article “What Can Mississippi Learn from Iran?” notes that 84% of our health care dollar is spent on treating and managing chronic conditions. Interventions that impact these conditions pay off in reduced morbidity and expense. Health care does not exist in a vacuum but rather in a larger social context. The article raises many questions about poverty, equity and humanity. What are the implications of promoting our current system over other alternatives that recognize human shortcomings and work within existing social contexts? Imagine how the U.S. appears to those in countries as disparate as Iran, France, Great Britain, Canada and many more that provide health care as part of the social contract? Compare and contrast the crying needs and resource shortages described in this article to the context that many Americans, provider and patients alike exist in – where technology, procedures and interventions reign, all too often driven by factors other than clear evidence, and frequently administered not based upon clear and compelling need, but rather by the ability to pay or the desire to be paid. There is nothing inherently wrong with profit, but should it be the driving factor in a health care system any more than it should be the driver for education or other social needs and goods? From the New York Times on Sunday March 14, this article states the obvious; that avoiding change in the health care system is not an option and that payers will exercise some decision-making and control over what is paid for and permitted. An inherent challenge in any system where the payers are not the consumers is that usual marketplace controls are not present. When we pay ourselves, we generally exercise restraint. In health care it is the rare service that is paid for by the patient. The patient has no particular motivation to not consume, or to shop for price, and the providers have motivation to treat and sell services to the degree that they can be medically justified. 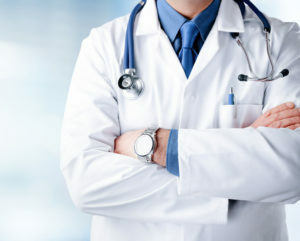 An interesting thought experiment would be to imagine a patient seeking or being advised to obtain a given treatment, and then instead of being given the treatment, they are given the money that the treatment would cost at the place they were considering, and told that they have a choice of getting the treatment, keeping the money and foregoing the treatment, shopping for the treatment at a lower cost and keeping the difference, or changing the type and extent of the treatment (for example switching from a brand name to generic drug). Obviously the complex nature of diagnosis and treatment would make decision-making a challenge for many. Furthermore, irresponsible behavior combined with the perverse incentive of keeping the cash would mean that many would take the money and not vaccinate their kids, and generally be more resistant to preventive care where they are not currently suffering or in pain. Health reform proposals as best we can tell, are not meaningfully addressing the excess utilization trends that occur regularly.